As at end of Oct 2007, the Singapore Butterfly checklist stands at 280 species (with 3 subspecies) - not bad for a tiny little island in the sun of about 700 sq km. There are species which have not yet been confidently identified, and more information would have to be available before these are added to the checklist. A recent one re-discovered was the Green Oakblue (Arhopala eumolphus maxwelli) which is a forest denizen. 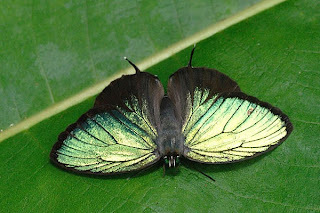 The upperside iridescent green of the male of this species is quite characteristic of a group of Arhopala which is green as opposed to purple or blue on the uppersides. The long white tipped tails also distinguish this species from the other two known 'green' Arhopala found in Singapore - A. aurea and A. trogon. As luck would have it, our hardworking members of ButterflyCircle also managed to discover the host plant of the Green Oakblue and also found eggs of the species. Dr Horace Tan managed to record the life history of this species from egg to adult. Several known locations within the nature reserves areas of Singapore are home to this species, and only recently have we managed to record the reliable existence of this species in Singapore, without any wild and dubious claims that the species was first found in Singapore when a specimen "flew up to someone's HDB apartment and died in an NSS butterfly collector's flat!" Special thanks to Sunny Chir for first photographing this species in the wild.